On March 5, 2017 a 30 year old male from Nelson was the driver of a Southbound single vehicle that drove off Highway 3A near Balfour, BC. The male was found deceased at the scene several hours after being reported missing by family. and until permission from the Coroner has been given. RCMP members of West Kootenay Traffic and Nelson Detachment in conjunction with the BC Coroner’s Service will be working together to determine the cause of the collision. At this point, road conditions do not appear to be a major contributing factor. This entry was posted in accidents, Nelson, News and tagged accident, Balfour, death, vehicle on March 8, 2017 by gftvboss. 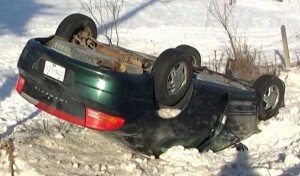 Just after 9AM today (Jan 14,2014) a Chrysler Intrepid slid off the icy North Fork Road and flipped over onto its roof. This happened in the 8300 block of North Fork Road just after the last bend in the road before it meets the Coal Shute / Hardy Mountain intersection. It was operated by a woman believed to be “in her 60’s”. She was the lone occupant and was extracted by Fire Rescue and transported by Ambulance to the hospital. RCMP also attended and for nearly a half hour traffic had to be managed through the space with emergency vehicles occupying both sides of the road. This entry was posted in accidents, News and tagged ice, road, vehicle on January 14, 2014 by gftvboss.